Spotted this as one of the DC Showcases available on Flipkart, and since the price was significantly lower than the standard ones, I did a recce on it. Turned out the price was low since the Showcase itself was significantly smaller - Bat Lash was a character with a very short run. I did some reading up which made these comics seem my sort, so I took the gamble. Bat Lash is a Western hero come up with by Sergio Aragones (MAD magazine, Groo) and Dennis O' Neil (lots of my fav Batman era comics). When I saw that line-up I knew I had to check it out. Having read through the entire volume in a couple sittings, I can say I didn't regret it. Lash is in most of his outings the old-skool happy go lucky type, attracted to the ladies and while (very unsuccessfully) not looking for a fight, doesn't flinch away from one that comes to him...and one always does. The character is very similar to Terence Hill's Trinity and to a smaller extent, Bruce Campbell's Brisco County Jr. (a major difference being that Brisco is on the side of the law). Most episodes are self-contained and feature Lash getting into and out of a scrape, and kissing a pretty girl at some point. 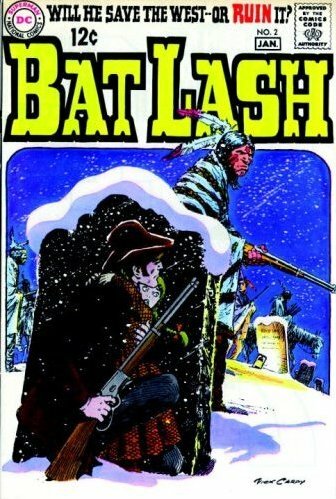 Towards the latter part of the series, Bat Lash's origin is revealed: His family was a duped by a land grabber and apathy from the law drove him to become a murderer and fugitive. The episodes dealing with the origin have a darker tone than the other stories. On the whole this is decent light reading if you like that sort of thing.